Top 3 features of the Machone smartphone by Karbonn - Is it worth buying? Karbonn Mobiles recently released their newest smartphone in the Indian smartphone market, the 'Machone' pronounced as the 'Mach One'. This smartphone is from one of Karbonn's Titanium series and is officially known as the Titanium S310. I got my hands on the said cellphone and have been using it for the past few days. Here are, according to me, three of the top features of the Karbonn Machone that will give its competitors a run for your money. Admit it! We all are guilty of checking our Facebook/WhatsApp/Instagram status messages every other minute. And to be able to do that, we first press the power button on our cellphones to awaken it, unlock the screen and then start the respective app. What if, there was a shortcut that would let you check all the above with just a click of a button or through a single gesture? The Smart Awake shortcut feature lets you get to your favourite app without the hassles of the above. While in the sleep mode, draw a pre-selected alphabet shape on the phone screen and the apps/shortcuts assigned to that alphabet will start without even the need to press the Power key to wake the device. Drawing a 'C' for example would open the 'Chrome Browser' if you've set it up as a shortcut. If you continuously use the WhatsApp messenger, assign the alphabet 'W' to it and the next time you draw a 'W' on the blank switched off screen, WhatsApp will directly appear on your screen. Isn't that brilliant!! Apart from giving you the ability to start your favourite apps without even waking up the smartphone, this device also gives you a host of gestures as shortcuts that make handling your smartphone a breeze. Mobile phone manufactures spend a lot of time, research and energy trying to simplify every little move that we make on our smartphone. They even position the most important and most used buttons as close and strategically located to the thumb or finger. The gesture mode on this device, goes a step further and lets you use this device with even more simplicity. With your Machone smartphone's display off, double tapping the screen will wake it up and bring you to the welcome page. After using the phone for a bit, switch the display off by double tapping the screen again. Pretty nifty isn't it? Swipe up using two fingers and a pre-selected app starts automatically. Swipe down with two fingers to open another app that you frequently use. Swipe down using three fingers and the MachOne will automatically take a screenshot! I've currently set the swipe up gesture to open my SMS inbox and the swipe down gesture for the phone's Settings menu. As these are some of my most commonly used apps, I find it extremely easy to get to them using this feature. Having used this smartphone for about a week now, I've gotten so used to this feature that I wonder how it'll be when I move to another smartphone after reviewing this one. This is one feature that you normally do not get in a sub-7000 rupee device. A sensor in-built into the MachOne that keeps an eye on your eyes! While watching a movie or a video on your smartphone, if you look away for a bit to check something else, the video automatically pauses. The sensor then waits for you to look back at it and starts the playback again once it catches your eye. This particular feature is what I thought was one of its greatest and is currently available only on high-end smartphones. Now that I've got you interested in this smartphone, here are some more features that are worth mentioning. The rear facing camera on this device is an 8 megapixel auto-focus camera that lets you take pictures by using your voice. Yes! you heard it right, the in-built camera lets you activate an option in the settings that will trigger the shutter release when you say something like 'Cheese' or 'Shoot'. The dual microphones on the MachOne pick up the sound wave and then take a picture. This is pretty useful when you need a very steady shot and do not want your moving hands to spoil the photograph. The front facing camera is a 5 megapixel shooter and comes with an LED flash. This is the first smartphone that I've seen that incorporates a front facing flash for selfies. No more dull or low light selfies anymore. I've tried it myself and pictures come out brighter. There's another feature with the front facing camera that lets you take selfies without the need to move your thumb. All you need to do it 'blink' with an eye and the camera will sense it and trigger the shutter release button, and take a selfie. This is another unique feature of the Karbonn Mach One. 8GB internal storage upgradable to 32GB via an external microSD card. 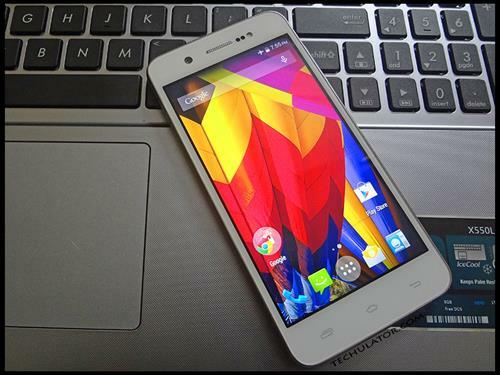 If you are on the lookout to buy a smartphone and are constrained by budget, do have a look at the Karbonn MachOne. Its light-weight, its sleek and gives you more bang for your buck. That is really a great information on a "trending " smartphone. It really has some innovative features. One of them being the gesture control and voice activation for a wide range of functions. The other best thing I would rate above the rest would be the flash for front camera. That is an innovative thinking from the manufacturer and might be a standard feature of the devices of the future. Thanks for letting us know of this awesome device.